This will be held at the STFC Rutherford Appleton Laboratory, Oxfordshire, UK, between August 15-23, 2019. The school will be hosted jointly by STFC (UK), Paul Scherrer Institut (Switzerland) and University of Oxford (UK). The first PCG Intensive School in Physical Crystallography, “From Phonons to Phase Transitions”, will be held at Cosener’s House, Abingdon (UK) from the 18-21 of June 2018. Register by Friday 30th March! Materials Week commences 13th Feb 2017, run by the Materials GRP. Young Speakers Lecture Competition at Warwick on Monday 13th February at 6.30pm. We are looking for Warwick students and early career academics to participate in the event. RTP Talks and Tours 7th December 12.00 - 14.00: highly relevant for experimentalists, electron microscopy and bioimaging. A one day training workshop will be delivered immediately before the conference, by recognised experts in the field, aimed primarily at scanning probe microscopists with an intermediate level of experience, to widen and deepen their knowledge base. Several Materials Physics students attended this very interdisciplinary event which included talks from several Physics academics. Several events for Materials Physics students during this busy week: full programme here. We have a Materials Physics team for the Egg Drop Challenge: good luck! Update: a magnificent second place - nicely done! The lecture by Sir Kostantin Novoselov pretty much packed out PLT and a good number of staff and students had a chance to chat with the Nobel Prize winner afterwards. Below: students grilling Dr. Bell at the poster exhibition! 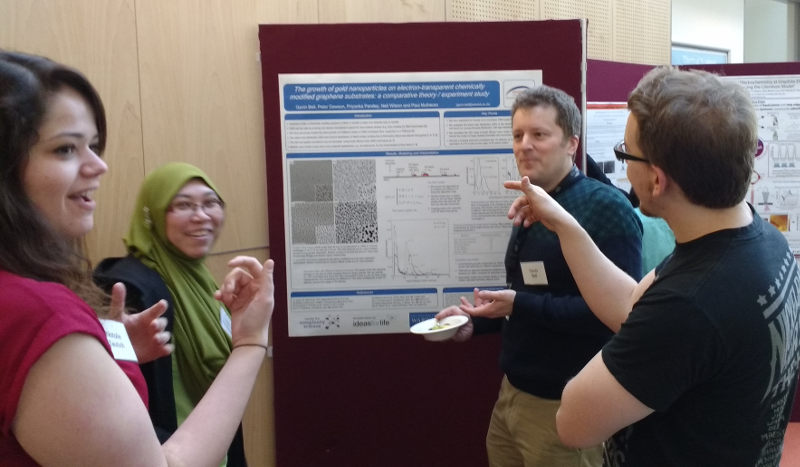 Materials GRP Poster Exhibition: congratulations to George Petrou for winning the poster prize for summer UG students. George worked in the Surface, Interface & Thin Film group alongside several Materials Physics students. Dr. John Hammond of Physical Electronics (PHI), USA, spoke on the latest XPS, AES and TOF-SIMS techniques and their complementary capabilities in analysing nano-materials and thin films. For reference, the abstract is here (pdf). Pizza and refreshments for new and current students and an opportunity to meet mentors. Well attended! An introduction to the Warwick Photoemission Facility by Dr. Marc Walker and to the X-ray Diffraction Facility by Dr. David Walker. Followed by poster session and lab tours. 21 PhD students attended this meeting, many of whom took the opportunity to present their work at the poster session. This seminar was held in Complexity and focused on the spatial regularity of semiconductor quantum dots. It was given by Dr. Konishi, an IAS Residential Fellow. The showcase event for second year students presenting their PhD work and getting formal feedback from their second supervisors. Around 10 Materials Physics Posters were presented and assessed. This seminar introduced aspects of reflectivity studies of thin-film heterostructures and magnetic materials using X-rays and neutrons. Dr. Thomas Saerbeck of the Institut Laue-Langevin in Grenoble gave an entertaining talk on the topic of (Polarized) Neutron Scattering Studies on the Nanoscale and Dr. David Walker, facility manager of Warwick’s X-ray Diffraction Research Technology Platform, introduced our own capabilities in X-ray diffraction and reflectivity. Beer, soft drinks, pizza and discussion (both scientific and otherwise) were enjoyed by all!